In my last post, I described the various electronic components in my soon-to-be wireless thermo- and hygrometer. In this post, we’ll look at how to wire up some prototype perf boards. An nRF24L01 radio module communicates with its host using SPI. Luckily for us, the Arduino (as well as most of the Atmel AVR chips in general) supports SPI directly in the hardware. The hardware SPI pins on the Arduino UNO are digital pins 11 (MOSI), 12 (MISO), and 13 (SCK). Furthermore, we need to wire up the radio module’s pins for CSN (Chip Select), CE (Chip Enable), VCC (3.3V), and GND. There’s also a pin called IRQ, but it seems to be used less commonly. All I/O pins are 5V tolerant, but VCC must not be above 3.6V according to the datasheet. 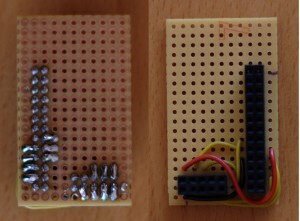 This means that we don’t need to have a level-converter chip in order to use the radio module with an Arduino. The DHT22 sensor is much simpler to hook up. It has four pins, but we only need three of them. I would have liked to use one of the remaining “traditional” digital pins on the Arduino, but due to the infamous pin header alignment bug, it’s much easier to reconfigure one of the analog input pins as a digital pin when using perf board. I have used pin A5, which is also known as digital pin 19. According to the datasheet, there’s supposed to be a pull-up resistor from the data pin to VCC. In practice it seems that the weak internal pull-up in the ATMEGA chip is enough. 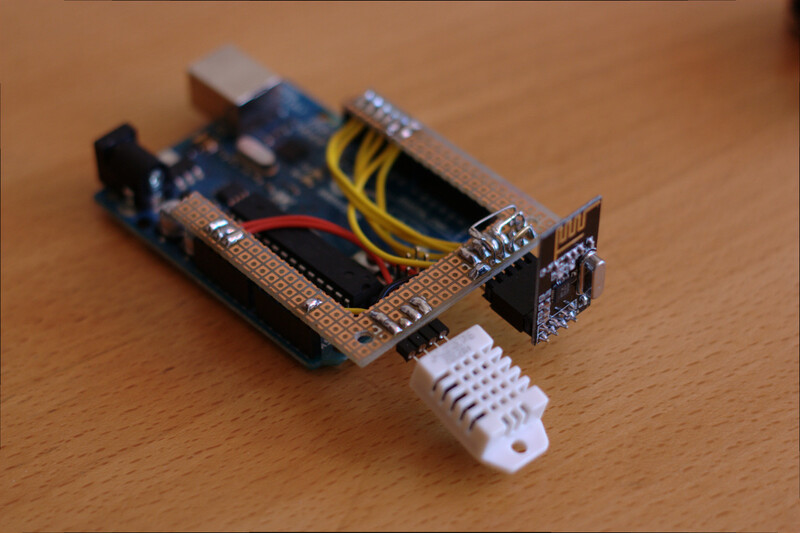 The sensor uses a weird 1-wire protocol on the data-pin, but fortunately we have the library provided by Adafruit. With this knowledge it is just a matter of finding a suitable piece of perf board and the various needed bits and pieces. I must say that I never thought I would find a purpose for this exact piece of scrap perf board, but in this case it’s perfect. This is mostly based on the documentation for this code I found while researching how to connect the parts. 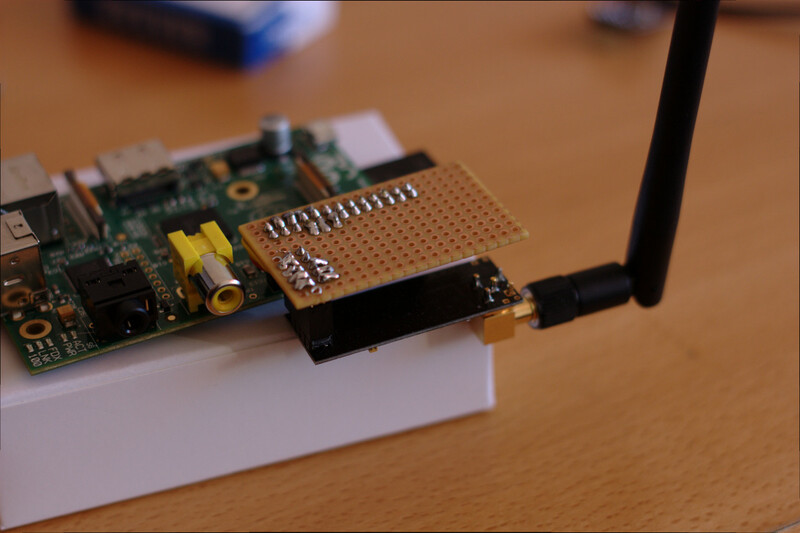 It is a Raspberry Pi port of a Beagleboard port of Maniacbug’s nice RF24 library for Arduino. The author writes that he doesn’t know if it works or not. Well it doesn’t. Not right away at least. It took some work to get running, but I’ll get back to that in the next post. That’s it! Our prototype hardware is finished. In the next post I’ll explain how to get a simple ping/pong test working.